Mozart in the womb, Baby Einstein DVD's for newborns and i-pad learning apps for toddlers. From the moment the umbilical cord is cut, today's parents feel trapped in a never-ending race to ensure their child is the brightest and the best. But while it's completely natural for us to want our kids to reach their potential, at what point does too much competition become damaging? With constant testing in schools also raising the stakes, how can we tell when hot-housing children is actually doing more harm than good? In this ground-breaking and provocative book, award-winning journalist and parenting author Tanith Carey presents the latest research on what this contest is doing to the next generation. She explains why, far from making our children more go-getting and successful, it can back-fire with life-long repercussions, damage their emotional well-being and fracture their relationships with the very people who love them most: their parents. 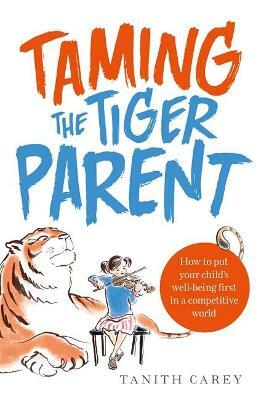 In this essential manual for today's modern parent, Tanith offers parents practical, realistic solutions that will give them permission to take their foot off the gas and reclaim a more relaxed family life. Packed with insights, experts' tips, real experiences and resources, this book is a timely guide to safeguarding your child's well-being in a competitive world - so they can grow into the happy, emotionally balanced people they really need to be. 'I've hardly been able to put the book down . . . as I turned each page I'd find something else that resonated with me. . . Tanith has the ability to challenge your thinking without it being judgmental or preachy. She shares lots of real life case studies and draws on her own experience as a parent and combines this with solid research to make a really readable book. 'A brilliant new parenting book . . . filled with strategies for raising children's self-esteem and nurturing them and how to help children avoid burn out and stress. I like how simple, doable yet effective these strategies are . . . I relished this book and I think it is really important. 'The book is GREAT . . . in a great tradition along with Madeleine Bunting's Willing Slaves, and Sue Gerhardt's The Selfish Society, and of course Kim Payne's Simplicity Parenting, as critiques of society that also help us re-orient our parenting . . . beautifully lucid and readable, and . . . definitely on the right track in terms of what kids need.